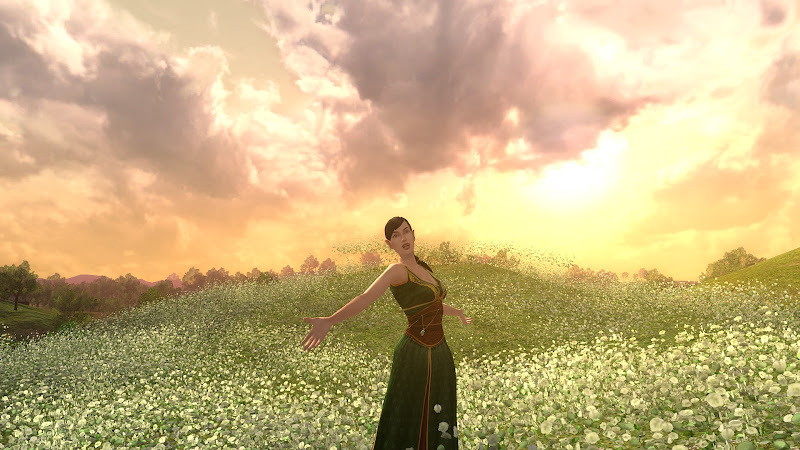 Lhinnthel may not be a hobbit in form, but she certainly feels like one at heart! The Shire is one of her favorite places to explore. This beautiful view can be found near The Hill in Michel Delving. 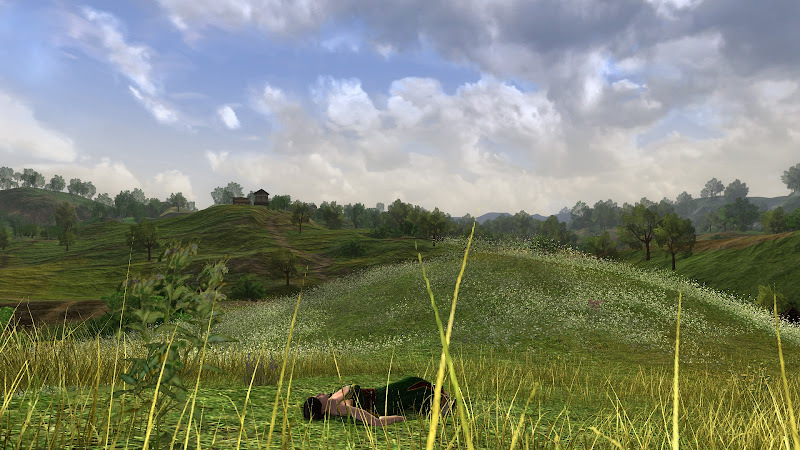 She sighs as she sinks down into the soft grasses of the green forever-summer hilltop. The blades brush against the soles of her weary feet as her arms fall to her sides, palms touching the ground. She turns her face slightly into a breeze so soft it barely whispers as it caresses the tips of her ears. A giggle escapes as she jumps up to spin with the breeze, trying to capture its merriment. She lifts her hand and shades her gaze; a perfect view stretches on and on, over the hills and valleys, streams and forests. There is a clear horizon reaching into a faded infinite beyond. A slight smile touches her lips, as her eyes greedily feast on all they behold. She turns her head as the sound of laughter passes by; drifting as if a melody of summer. It whirls and tumbles about her with the seed puffs that dot the summer breeze. The laughter and she are one, caught up in an endless dance only a kindred soul might see. Savoring this moment of simple happiness, she falls backwards into the mossy carpet. Her deep brown hair spills like a waterfall over her bare arms and sun-kissed shoulders. As her chin lifts slightly, eyes the color of a stormy sea drink in the large puffy clouds. The sky is full of clouds in hues of white and grey. They billow like a ship’s sail across an unblemished robin’s egg blue sky. Laughter plays at the corners of her mouth. Her fingers fan out against the green with a sigh and one leg is tossed carelessly atop the other as she stretches; toes pulling towards the earth as far as they can possibly reach. The warmth of hot sun rays make her drowsy and she slips into a daydream. The light creates rings of golden orange colored roses and pulses like life against her resting eyelids. Joy spreads from her center, carrying with it waves of happiness and thankfulness for this sweet, beautiful day. She takes a deep breath as her thick lashes flutter against cheeks pinkened by the fading sunlight. Blinking, she awakens and holds close to her heart a perfect day full of peace and beauty; knowing these hidden moments are not just a dream.